The Select Asphalt Solution is a plan designed to maintain and beautify your asphalt pavement, thus maximizing the life of your pavement and minimizing your cost. Preventative asphalt maintenance includes crack filling, patching, and sealcoating your asphalt pavement. Effective preventative maintenance requires regular monitoring to ensure that the selected asphalt procedures are producing the predicted desired result. We approach every job with the same goal in mind: protect and beautify our clients' asphalt, while saving them both time and money. Our A+ rating on both HomeAdvisor™ and Angie's List™ speaks for itself. Asphalt: A dark brown to black cementitious material in which the predominating constituents are bitumens, which occur in nature or are obtained in petroleum processing. Asphalt is a constituent in varying proportions of most crude petroleum and used for paving, roofing, industrial procedures, and other special purposes. Pothole: A hole formed in pavement by excessive use or by extremes of weather. 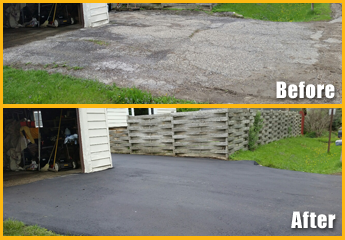 Sealcoat: A thin surface treatment used to improve the surface texture and protect an asphalt surface. The main types of sealcoats are fog seals, sand seals, slurry seals, micro-surfacing, cape seals, sandwich seals, and chip seals.